Home » Toyota Tacoma » How powerful is the 2019 Toyota Tacoma? Though it may not seem like it on the forefront, pickup trucks come in many different shapes and sizes, each of them able to perform seriously well both on and off the pavement. One of the industry’s leading models in the mid-size pickup market is the Toyota Tacoma, equally at home on the highway or on the trails. We want to give you an inside look at the 2019 Tacoma’s full capability, so come join Alexander Toyota today as we show you the 2019 Toyota Tacoma available engine options and trim level prices! Two engines come available for the 2019 Tacoma, each of them highly capable and able to provide all the serious strength you could ever desire. First things first, the Tacoma’s base engine is a 2.7-liter Inline 4 that can produce up to 159 horsepower and handle a maximum tow rating of up to 3,500 pounds. If you’re looking for a bit more in the way of performance and precision, however, the 2019 Tacoma has you covered. 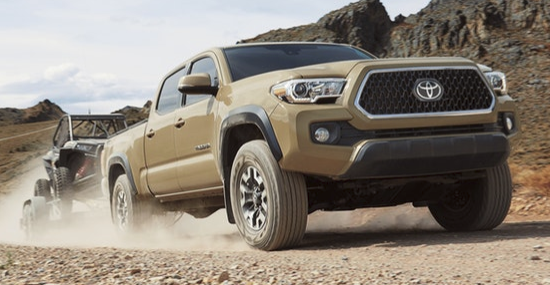 It offers an available 3.5-liter Direct Injection V6 engine, able to churn out as high as 278 horsepower; plus, with its optional Tow Package, the 2019 Tacoma can tow as much as 6,800 pounds and accommodate up to 1,440 pounds of payload! 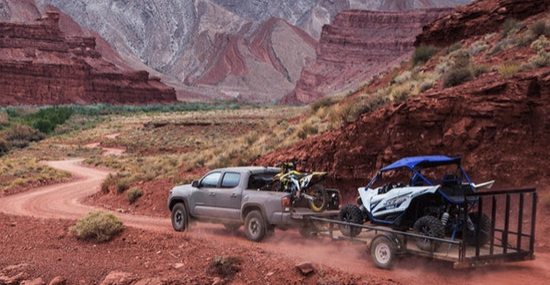 The Yuma area isn’t short on off-road ready adventures, making the 2019 Tacoma a prime vehicle for every journey you want to go on. It’s currently available right here at Alexander Toyota, so contact our sales team today to schedule a test drive whenever you want! This entry was posted on Tuesday, December 18th, 2018 at 4:14 pm	and is filed under Toyota Tacoma. You can follow any responses to this entry through the RSS 2.0 feed. You can skip to the end and leave a response. Pinging is currently not allowed.